The Good: I have never used Chanel polish before, and I was instantly impressed with the liquidy yet opaque coverage. Two coats produced a very nice even color, which isn’t always the case with a shimmery nail polish. Also, Wendy had complained the polish lacked a blue-ish tint that she saw in the bottle. Depending on the light, I could see blue, gold, along with the obvious green colors. The Questionable: After about 4 to 5 days of wear on my fingernails, I started to see small chips. This is about average for any nail polish I wear, but I was hoping for something extraordinary for the price. However, thanks to the reflective quality of the color, chips camouflage well. 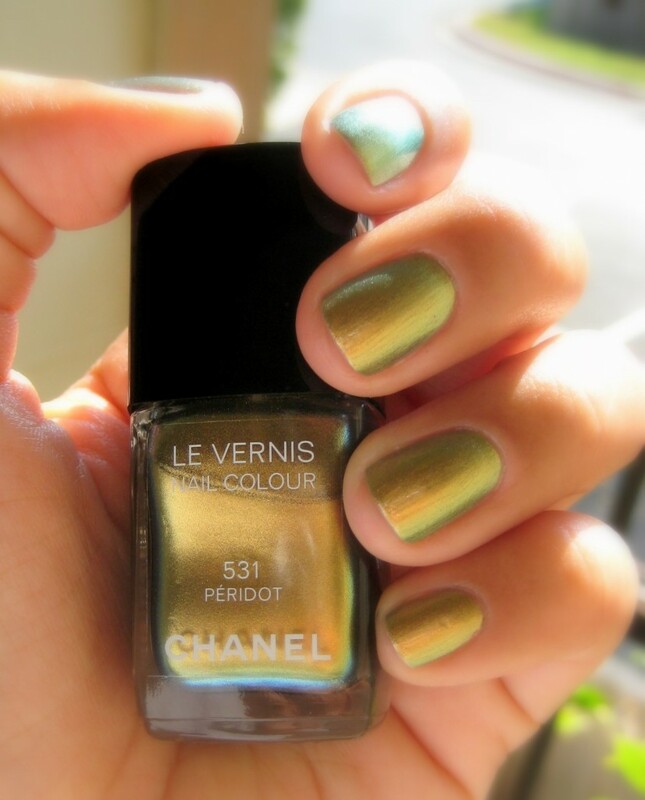 The Verdict: I may never forgive Wendy for exposing me to the world of Chanel Le Vernis Nail Colour. I adore the application of this polish, but at $25, it’s a bit rich for my blood. I have never seen a color like this, and for that, I’m willing to suffer Wendy’s looks of disgust while I proudly and successfully wear it. However, so that you don’t share in Wendy’s disappointment, I think Peridot is a color best worn by people with warm skin undertones. For those of you with cool undertones (ahem, co-blogger), I think the new Chanel denim-inspired colors would be a better fit. Dang it, I hit the Like button on accident! Where’s the ‘Loathe’ button on this thing?? Kidding, I’m SOOO glad somebody got some use out of this. Mostly. I thought you were wearing this polish this weekend! I didn’t say anything though, because I didn’t want to accuse you of wearing “ugly” polish. It did look good on you though! I was wearing the Peridot on my toes Friday, but I had changed it for Saturday night. That crackle polish gets a review soon!